Germany has ambitious plans for both electric cars and renewable energy. But it can’t deliver both. As things stand, Germany’s well-meaning but contradictory ambitions would actually boost emissions by an amount comparable with the present-day emissions of the entire country of Uruguay or the state of Montana. In October 2016 the Bundesrat, the country’s upper legislative chamber, called for Germany to support a phase-out of gasoline vehicles by 2030. The resolution isn’t official government policy, but even talk of such a ban sends a strong signal towards the country’s huge car industry. So what if Germany really did go 100% electric by 2030? To environmentalists, such a change sounds perfect. After all, road transport is responsible for a big chunk of our emissions and replacing regular petrol vehicles with electric cars is a great way to cut the carbon footprint. But it isn’t that simple. The basic problem is that an electric car running on power generated by dirty coal or gas actually creates more emissions than a car that burns petrol. For such a switch to actually reduce net emissions, the electricity that powers those cars must be renewable. And, unless things change, Germany is unlikely to have enough green energy in time. 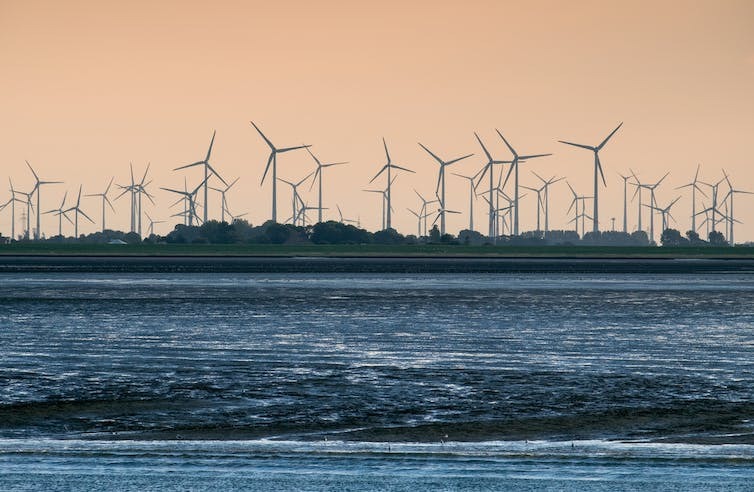 After all, news of the potential petrol car ban came just after the chancellor, Angela Merkel, had announced she would slow the expansion in new wind farms as too much intermittent renewable power was making the grid unstable. Meanwhile, after Fukushima, Germany has pledged to retire its entire nuclear reactor fleet by 2022. Germany’s grid is struggling to cope with all that intermittent power. In an analysis published in Nature, my colleague Harry Hoster and I have looked at how Germany’s electricity and transport policies are intertwined. They each serve the noble goal of reducing greenhouse gas emissions. Yet, when combined, they might actually lead to increased emissions. We investigated what it would take for Germany to keep to its announcements and fully electrify its road transportation – and what that would mean for emissions. Our research shows that you can’t simply erase fossil fuels from both energy and transport in one go, as Germany may be about to find out. It’s certainly true that replacing internal combustion vehicles with electric ones would overnight lead to a huge reduction in Germany’s energy needs. This is because electric cars are far more efficient. When petrol is burned, just 30% or less of the energy released is actually used to move the car forwards – the rest goes into exhaust heat, water pumps and other inefficiencies. Electric cars do lose some energy through recharging their batteries, but overall at least 75% goes into actual movement. Each year, German vehicles burn around 572 terawatt-hour (TWh)‘s worth of liquid fuels. Based on the above efficiency savings, a fully electrified road transport sector would use around 229 TWh. So Germany would use less energy overall (as petrol is a source of energy) but it would need an astonishing amount of new renewable or nuclear generation. And there is another issue: Germany also plans to phase out its nuclear power plants, ideally by 2022, but 2030 at the latest. This creates a further void of 92TWh to be filled. Adding up the extra renewable electricity needed to power millions of cars, and that required to replace nuclear plants, gives us a total of 321 TWh of new generation required by 2030. That’s equivalent to dozens of massive new power stations. Even if renewable energy expands at the maximum rate allowed by Germany’s latest plan, it will still only cover around 63 TWh of what’s required. Hydro, geothermal and biomass don’t suffer from the same intermittency problems as wind or solar, yet the country is already close to its potential in all three. This therefore means the rest of the gap – an enormous 258 TWh – will have to be filled by coal or natural gas. That is the the current total electricity consumption of Spain, or ten Irelands. Germany could choose to fill the gap entirely with coal or gas plants. However, relying entirely on coal would lead to further annual emissions of 260 million tonnes of carbon dioxide while gas alone would mean 131m tonnes. By comparison, German road transport currently emits around 156m tonnes of CO2, largely from car exhausts. Therefore, unless the electricity shortfall is filled almost entirely with new natural gas plants, Germany could switch to 100% electric cars and it would still end up with a net increase in emissions. The above chart shows a more realistic scenario where half of the necessary electricity for electric cars would come from new gas plants and half from new coal plants. We have assumed both coal and gas would become 25% more efficient. In this relatively likely scenario, the emissions of the road transportation sector actually increase by 20%, or 32 million tonnes of CO2 (comparable to Uruguay or Montana’s annual emissions). If Germany really does want a substantial reduction in vehicle emissions, its energy and transport policies must work in sync. Instead of capping new solar plants or wind farms, it should delay the nuclear phase-out and focus on getting better at predicting electricity demand and storing renewable energy.